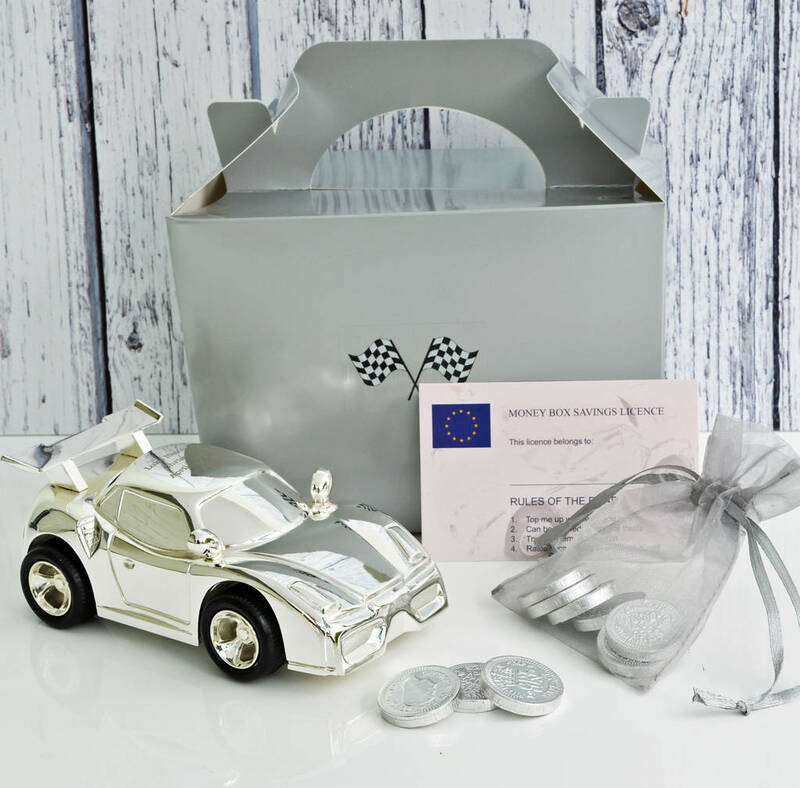 Start him off on the right track with a personalised car money box, available as a gift set and ideal as a christening gift. 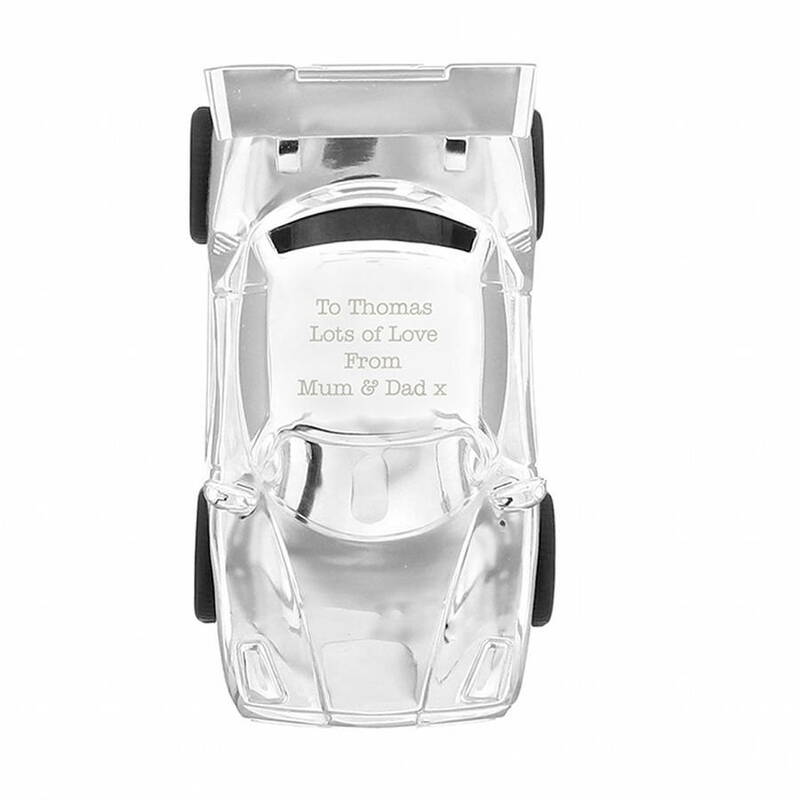 A perfect christening, Christmas or birthday gift for a special boy, a silver plated racing car money box. 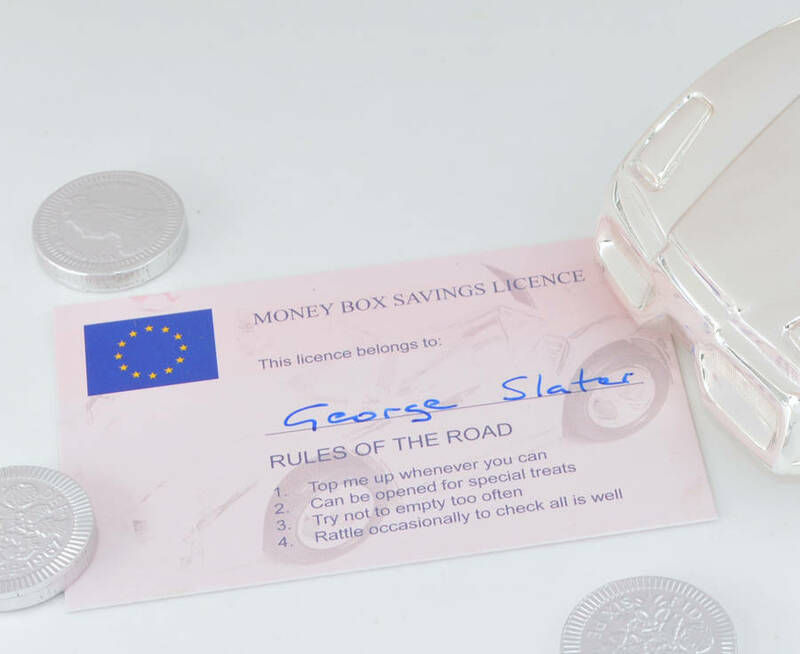 This lovely money box can come simply boxed on its own (-£5) or as a complete gift set with a Money Box Saver's Licence, which is based on the UK driver's licence. It includes a space for a name, left blank, so you can personalise it to the recipient. All presented in a silver card presentation box, so its ready to give straight away. 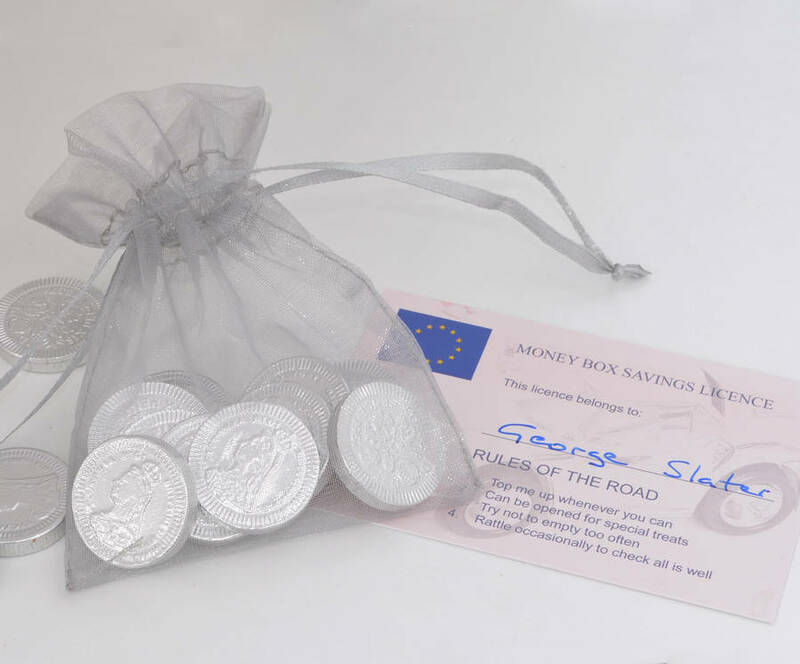 To make this an extra special gift for an additional £1.50 you can add a silver organza bag of 10 chocolate sixpences. Sixpences have long been associated with good luck and have on one side the Latin phrase 'FidDef' short for Fidei Desfensor, meaning defender of the faith, which is a nice touch for a christening gift.. Please note that the image shows the complete gift set. 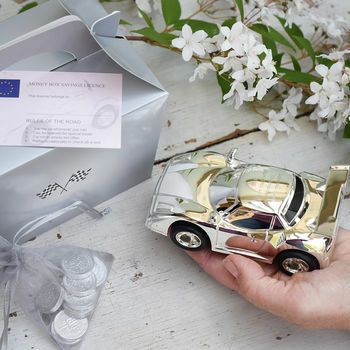 The money box can be personalised on the roof with four lines of text of up to 18 characters per line. All personalisation is case sensitive and will appear as entered. Please note that due to the nature of this product and the font type used please refrain from using all capitals in your personalised message. This is a decorative item and is not a toy. Silver plate. 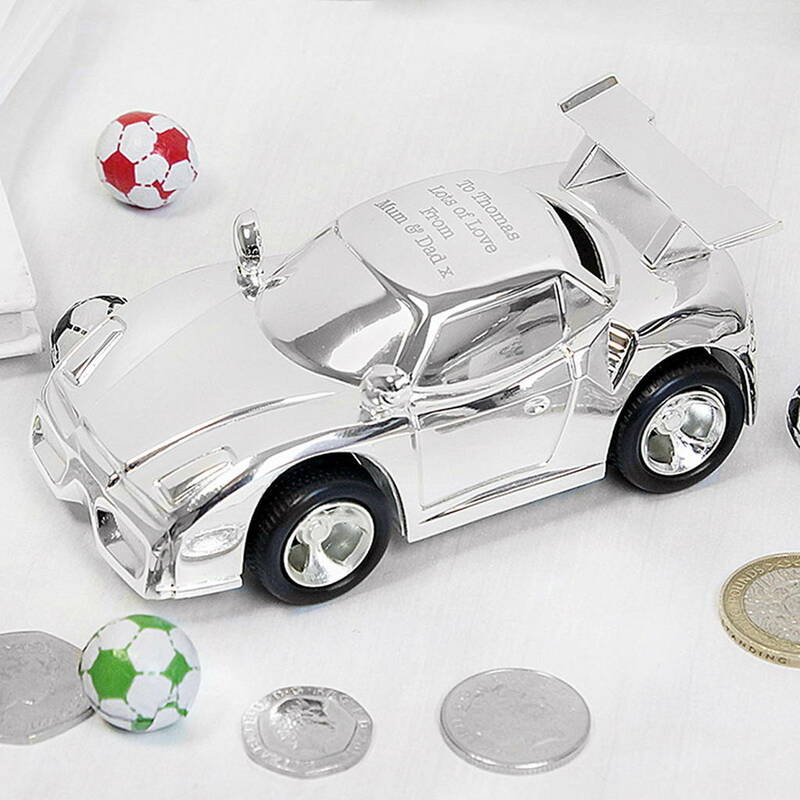 As with all silver products, some tarnishing will occur over time. A quick wipe with a silver cloth should restore it to shiny splendour. Chocolate sixpences are foil wrapped milk chocolate. Ingredients : sugar, whole milk powder, cocoa butter, cocoa mass, whey powder (milk), emulsifier, soya lecihtin, natural vanilla flavouring. Cocoa solids 28% min, milk solids 18% min.